The lighthouse at Battery Point is one of California's cutest. In fact, it looks more like a house with a light on top than the slender towers you might see elsewhere. Some people think the light has a resident ghost. In fact, it sometimes shows up on lists of America's most haunted lighthouses. The lighthouse is operated as a museum now, but you have to time your visit. The only time you can get there is at low tide when you can walk out to it. Check the tide levels ahead of time. It's a little less than half a mile walk from the parking area to the lighthouse. 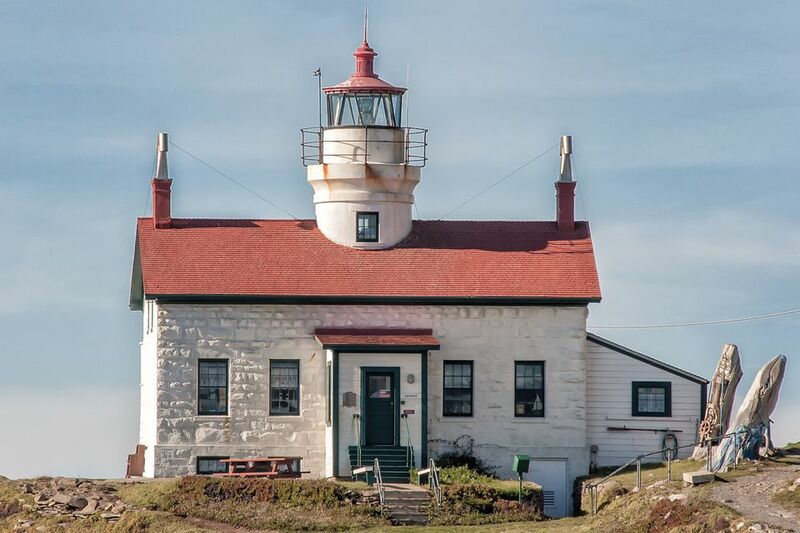 Once there, you can go inside the lighthouse where the original Fresnel lens is on display. If you go in the late afternoon, you might catch a gorgeous sunset. You can also walk around the island to enjoy the beach and tide pools. No one seems to know who the spirit might be, or why it's there. Paranormal investigators say two ghostly adults and one child live there. Other people say they have heard someone slowly climbing the tower steps during a storm. Caretakers report that their bedroom slippers mysteriously move to a new location while they're sleeping and a rocking chair sometimes moves on its own. Near the Oregon border at Crescent City, Battery Point Light was first lit in 1856. Since then, the structure has weathered many changes. Those have included automation in 1953 and a tidal wave that flooded the peninsula in 1964. In the 1850s, the city of San Francisco was growing. To build it, they needed lumber from Northern California. Crescent City was a shipping hub for the building materials, but the coastline was a problem. Many ships loaded with precious lumber were in danger on the rocky coast. The station's first official keeper was Theophilus Magruder. Magruder was a sophisticated Easterner, who was drawn to the west coast by the promise of gold. He earned $1,000 per year. When that was cut 40% in 1959, he resigned. Captain John Jeffrey and his wife Nellie took over the station in 1875 and stayed there for 39 years. The location was difficult for the Jeffreys family. Captain John sometimes had to get out a boat and row the children to shore so they could attend school. In 1879, a massive wave knocked down the kitchen wall and knocked over a lighted stove. The house would have burned down if it weren't for a second wave that put out the fire. A 1964 earthquake in Alaska set off the worst tsunami that ever hit northern California. It sped toward the Battery Point Light, with waves 20 feet high. Fortunately, the light and its keepers survived. The wave struck at an extreme angle that protected the structure. The town of Crescent City was not quite so lucky, though, and 29 city blocks were destroyed. The Cape Cod structure built of brick and granite. It offers visitors a look at the maritime history of the region. It also gives great insight into the life of a light keeper. Worn by storms and tidal waves, the 45-foot tower still functions today. In 1965, the lighthouse was decommissioned. It was replaced by a flashing light on a nearby breakwater. Battery Point is west of US Hwy 101 in Crescent City, a few miles south of the Oregon border. If you're going there to see the lighthouse, you could easily spend an entire weekend checking out the area. Use this guide to plan your Humboldt County trip. Battery Point Lighthouse is open seasonally, April through September. However, you can only get to it at low tide. And you need to allow enough time to look around and get back to shore before the tide rises. To find out when that is, call 707-464-3089 or check the tide table online.